I realized I didn’t include a significant moment from today in my earlier update and I can’t wait until tomorrow to share it so please forgive the multiple posts. We saw Everest for the first time on this trip today. The view point stops everyone in their tracks as they stop, stare, and take pictures. This first view is about 1/3 of the way up the Namche hill. Though I have seen this view about 10 times before, it never ceases to get my heart racing. It’s towering height, white flanks, and steep sides set against the intense blue sky blaze into my memory. I saw it first in 2002 on my first trek in the Khumbu. I remember early stirrings of the dream to climb Everest during that trek especially when we climbed Kala Patar and got a view of almost the entire route. The dream came fully into being in 2005 after I’d summitted Denali and then ridden a mountain bike from Lhasa to Kathmandu with a stop at Everest Base Camp on the Tibetan/North Side. When I stared at the overwhelming North Face of Everest, I knew I wanted to climb it-though I was totally intimidated by the fundraising (rather than the climbing). That moment of clear seeing of the dream and the path to inspire youth at the same time, set me on a decade long quest to climb Everest and the rest of the Seven Summits. 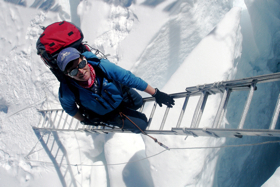 So today, as I once again, saw Everest, I was inundated with feelings and memories of climbs, summits, and struggles. I didn’t look too long but instead, committed once again to taking this expedition step by step, working hard to stay healthy and motivated, and to give the best of myself to the effort. I often talk about the need to balance the view with the footsteps. The view being the goal-that thing that is calling to us and the footsteps-the actions that will take us closer to that goal. We need both and we need to go back and forth between them. 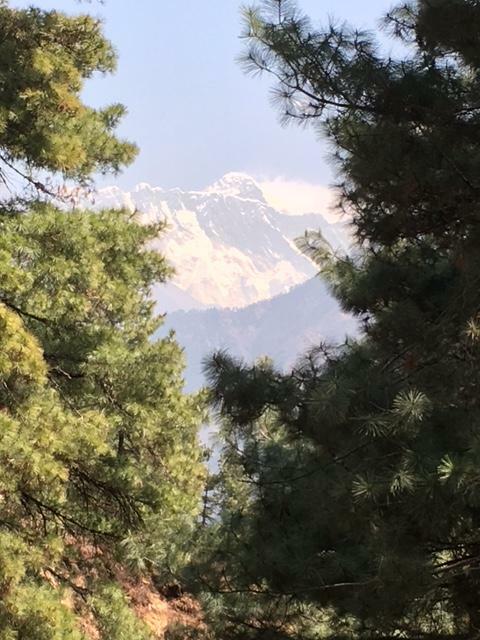 If the weather is clear, we’ll see Everest again tomorrow on our acclimatization hike and that will be awesome!